Velocity and number of bugs picked up over a specific period. Make sure the team is not chasing velocity and closing stories, but the quality is not good, so it results in bugs being logged to fix delivered stories. This also measures how quality increases within the team, while velocity (throughput) increases. 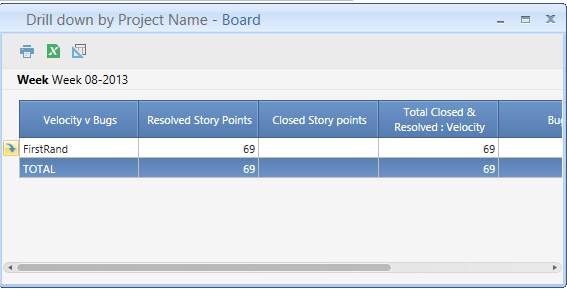 Velocity measure: story points per period for closed / resolved stories etc. Bugs measure: number of bugs logged per period. Red and Green indicators limit is set for this example on: Bugs % to velocity/issues alert on each page set at above 20%.